Too much comfort and status quo make me uncomfortable. Perhaps that helps explain why I had 10 different addresses in just my first 12 years of married life. And while they were all joyful moves of the upward mobility persuasion – and not as my then-husband liked to joke, to stay one step ahead of the creditors – I think it illustrates my notoriously itchy feet and restless spirit. 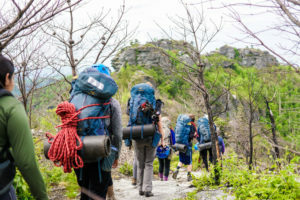 When I announced to my parents, at the age of 32, that I was planning to go on a four-day Outward Bound excursion in the North Carolina Mountains, I recall my mother (with whom I’m very close) was completely befuddled. “Why in the world does my ballerina want to go spend the night in the woods?” she asked. I didn’t understand her question. She didn’t understand my answer. It’s no exaggeration to say that my children have known since the beginning of their little lives that they were destined to go on their own Outward Bound adventure one day. I was so moved by my experience that I came home and wrote a to-do list for the girls in the event of my untimely death. Not sure if the list was more passionate mama bear or evidence of the extreme planner in me, but I wanted to make sure there was a road map if I was no longer around. And an Outward Bound experience for both of them topped the short list. But force it on them I did. And with mixed results. The interesting thing is that you don’t have to like something for it to be transformative. I can think of countless things that I bloody hated – living in NYC comes to mind – that were nonetheless critically important to my journey and positively impacted the trajectory of my life. And it was something like that that I sensed all those years ago. They don’t exactly offer “Warrior Goddess” training in school, so the self-sufficiency and pluck I was so eager to instill in my girls had to be, at times, outsourced. Says the founder of Outward Bound, Kurt Hahn: “There is more in us than we know.” Indeed. Though, with all due respect Mr. Hahn, I’m going with my girl’s quote. I’ve seen the results of NCOBS courses firsthand; even helped produce a few videos about the experience. “I had no idea I was that mentally tough. I’m freakin’ invincible,” may be the best post-course comment I’ve ever heard.